Our preschool and daycare centers use a unique curriculum for early education. Our inspired learning center is designed with your child’s needs and interests in mind. From playtime to curriculum, everything at our daycare center or in our preschool programs will help your child have fun and grow their social, cognitive, motor, and language skills. Our daycare centers — located in Cooper City, Davie, Pembroke Pines, and Weston — all utilize the Creative Curriculum, which teaches children through purposeful play activities. Schedule a tour today! Why choose Lil’ Rascals Academy and the Creative Curriculum? Children learn best through purposeful, fun activities that lead to high levels of thinking and understanding. Our preschool teachers and supervisors all nurture and support your child in their learning and creativity. This curriculum encourages open-ended questions, problem-solving, and initiating dialogue. 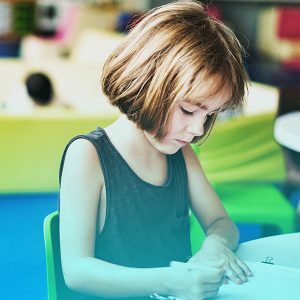 We utilize Brightwheel, which allows you to have a real-time connection to your child and their teacher. Our daycare facility is clean, well-lit, and full of fun, engaging activities for your child. We offer free tours so you can see how our daycare, preschool, or after school programs will work for you. Lil’ Rascals Academy utilizes the Creative Curriculum and shares their belief that children learn best through purposeful play activities that are planned by nurturing teachers who interact with them to encourage and support their choices. Child Development Specialists have done extensive research on why children need play incorporated in their daily day care center schedule. A learning center based preschool program is supportive of the findings within this research. Learning center time is a scheduled time of the day for children to explore in a non-teacher-directed situation. During learning center time, the teacher is a facilitator and will work individually with a child or work with a small group of children. This allows the teacher to take the child from the individual development they have already acquired to a higher level of early education development by asking open-ended questions, encouraging problem-solving and initiating dialogue in order for the child to move to a higher level of thinking and understanding. You expect the best for your child and want a nurturing and safe environment. Best-in-class early educational programs, professional teachers, and individualized attention, at Lil’ Rascals Academy you’ll find all that. Plus, a little something extra; that connection that instills the love of discovery and learning in your child. We call it inspired learning and that’s what makes Lil’ Rascals one of the most loved and enduring schools in Broward County. A typical day at Lil Rascals Academy might look a bit different than your average pre-school. We utilize an app called Brightwheel; allowing you, as a parent to have a real-time connection to your child and teacher. Giving you the advantage to participate in seeing your child harvesting from our garden, eating an organic meal – or helping to cook one for that matter, doing science experiments or discovering a language. We approach early education from a global vantage point and bring that to each child in our daycare.